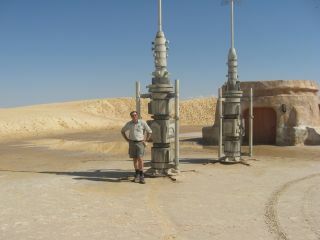 Lead researcher Ralph Lorenz in 2009, next to buildings in the "Mos Espa" set used in "Star Wars Episode I: The Phantom Menace." Call it Revenge of the Sand, or maybe Attack of the Dunes. An encroaching dune is threatening to wipe out several of the buildings used for a "Star Wars" movie set in 1997. The "Star Wars" location in Tunisia used for "Episode I: The Phantom Menace" is right in the path of a sand front that is advancing at a rate of 50 feet (15 meters) a year. Already the dune has swallowed portions of some structures. "We took the opportunity to go on the field trip to see what these [sandy] places are like up close, and by chance they had the "Star Wars" film set in there," Ralph Lorenz, the lead researcher, told SPACE.com. "It wasn’t something we set out to do, but when I got there I thought this would be a good hook for geomorphology teaching," said Lorenz, who is a planetary scientist at Johns Hopkins University's Applied Physics Lab. The same view in 2013, when a sand dune covered these buildings in the "Mos Espa" set used in "Star Wars Episode I: The Phantom Menace." The set is now a popular tourist attraction, with an estimated 100,000 visitors a year, as it is conveniently located by the oasis town of Tozeur. When looking at the buildings, however, Lorenz also spotted some scientific value. Dune movement is notoriously hard to measure because it usually takes place on featureless, sandy plains. There are few landmarks to chart a dune's progress. This is true not only on Earth, but also on Mars and Titan – a moon of Saturn that is of particular research interest to Lorenz. A wider view of the "Mos Espa" set used in "Star Wars Episode I: The Phantom Menace," which is under threat from an encroaching sand dune. Measuring the encroachment on Mos Espa could provide some "ground truth" for dune research on Earth and on other planets, Lorenz determined. His team used a combination of Google Earth images (which have high-resolution satellite shots of the area), lower-resolution Landsat satellite pictures and occasional visits to track the dune's progression. The movement rate depends principally on two factors: the threshold (based on density, gravity and cohesion) required to cause a grain to move and the wind speed variation – how often the wind exceeds this threshold. The Mos Espa dune speed is about average for other measured dunes on Earth, Lorenz said. But at 50 feet (15 metres) a year, it would take only a few years to quickly engulf the 330-foot (100-meter) wide set. Lorenz said, anecdotally, that he had heard that Tunisian authorities may trim the dune back before it causes too much damage. The dune at Mos Espa is a barchan – a sand bank that lies in right angles to the wind direction. Barchans can also occur in other solar system locations. The Mars Reconnaissance Orbiter's high-res camera has actually tracked barchans marching across the Martian surface, particularly at Nili Patera. There has been a claim of barchan-like forms on Titan, but they are essentially invisible to the NASA Cassini spacecraft during its periodic flybys through the Saturn system. "Because Titan's dunes are so large, they respond slowly to wind," Lorenz said. "Furthermore, because our resolution with Cassini is modest, we might not be able to detect this." The study was published in the July 2 edition of Geomorphologyand included researchers from Tunisia, the United States and Italy. Among the researchers was Gian Ori, the sedimentologist who organized the tour that brought Lorenz to Mos Espa for the first time.